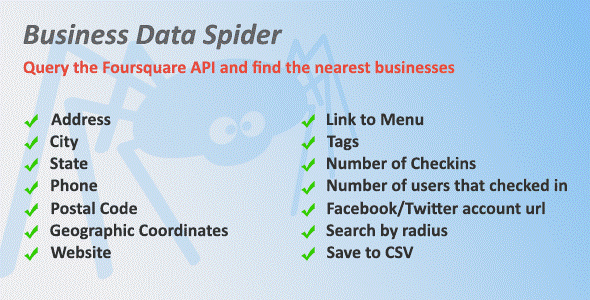 Business Data Spider - CODELISTPRO | Free Premium Scripts, Plugins, Apps Source Code. This script is a tool that makes querying the huge Foursquare database easier. It will search for keywords and return a list of businesses related to that keyword with the possibility of limiting the search by location. You can use this to quickly build a list of businesses in any niche or discover new places near some location.